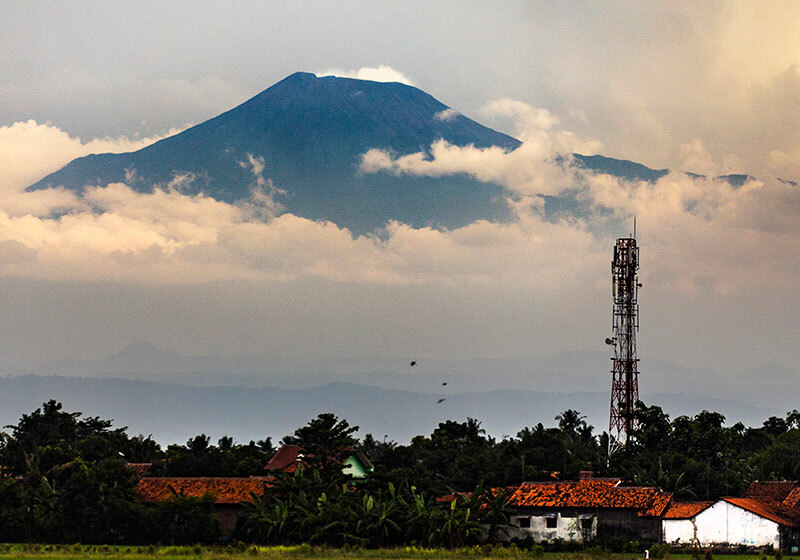 Mount Slamet Volcano, a majestic stratovolcano in Central Java, is Java’s second highest and one of its most active volcanoes. It contains a wide summit area with 4 craters. Its most recent eruption began in April 2009. Slamet has a cluster of about three dozen cinder cones on its lower SE-NE flanks and a single cinder cone on the western flank. The volcano is composed of two overlapping edifices, an older basaltic-andesite to andesitic volcano on the west and a younger basaltic to basaltic-andesite one on the east. Gunung Malang II cinder cone on the upper eastern flank on the younger edifice fed a lava flow that extends 6 km to the east. Four craters occur at the summit of Gunung Slamet, with activity migrating to the SW over time. Historical eruptions, recorded since the 18th century, have originated from a 150-m-deep, 450-m-wide, steep-walled crater at the western part of the summit and have consisted of explosive eruptions generally lasting a few days to a few weeks. Short Description: Mount Slamet or Gunung Slamet is an active stratovolcano in the Purbalingga Regency of Central Java, Indonesia.